A faithful reader sent me this. 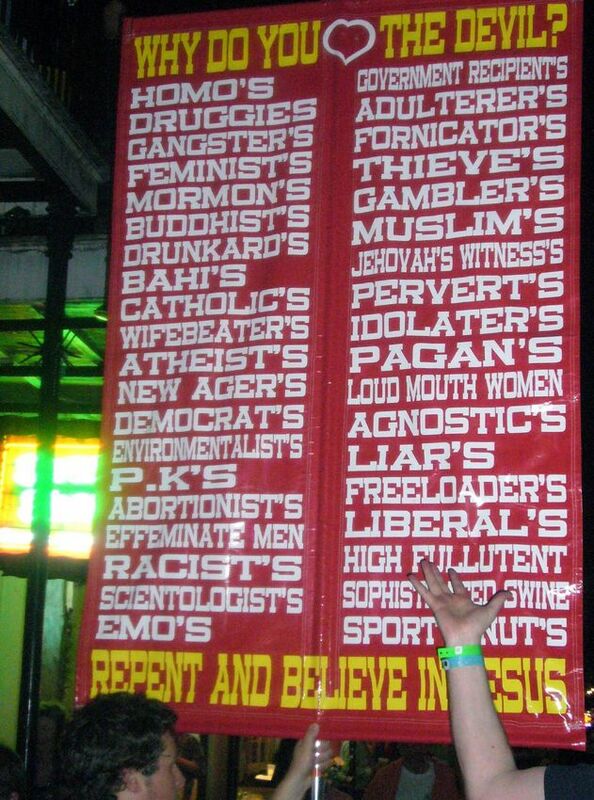 Did you ever see a better list of people who ought to repent? I especially enjoy its use of the grocers apostrophe. It nicely distinguishes them from the high fullutent grammar freaks. I might have to expand my prejudices. What is a P.K? An Emo? I cannot cope with all the evils being caused by these groups. This blog just focuses on govt officials who abuse the law to bust up families. 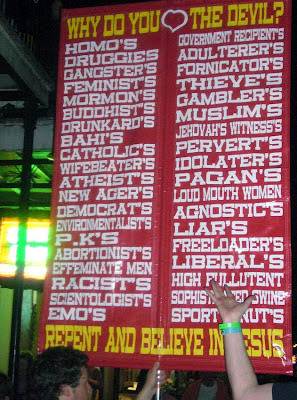 The Jews are conspicuously absent from this list. I suspect that the reason is a combination of (1) the sign-maker was worried that he would be called a bigot if he included Jews; (2) the Jews serve as great examples of sinners and they make some great Hollywood movies; and (3) we need the Jews to occupy Israel in fulfillment of Biblical prophecy for the 2nd Coming, according to Christian Zionism. But I could be wrong. "P.K." may also mean "Player Killer." Certainly I've seen enough of them as a gamer to know they're all hellbound. "Emo" is a specific subset of effeminate (but mostly straight) men, usually depressed, always rail-thin and wearing makeup. Congratulations on hitting new lows.